Katra Town, Lying In The Foot Of Trikuta Mountains, 48 Kms. From Jammu, Serves As The Base Camp For Visiting The Famous Shrine Of Shri Mata Vaishno Devi, Which Is Approachable On Foot Along A 13 Kms Long Well Laid Footpath. Every Year, More Than 4.5 Million Pilgrims Pass Through Katra On Their Way To The Holy Shrine. 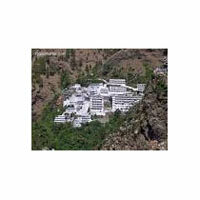 The Cave Shrine Of Mata Vaishno deviji Or Trikuta Bhagwati (Alt: 5,200 Ft.) Has Been A Beacon Of Faith And Fulfillment To Millions Of Devotees From All Over The World. The Pilgrimage To The Shrine Holds Great Significance For The Pilgrims. Arr. Jammu Airport/Railway Stn., transfer to Katra. Check in Hotel. Overnight stay. Early morning 14kms start from here to Vaishno Devi. After Darshan, trek down to Katra. Overnight stay. Morning visit Local Sight Seeing & Temples. Later, Transfer to Airport/Railway Stn. Dep. to Delhi.